Bentonville Battlefield State Historic Site background sheet. By the spring of 1865, the Civil War was all but over. But the brave Union and Confederate soldiers that fought the Battle of Bentonville March 19-21 that same year didn’t know they were participating in the last major battle of the “War between the States”. Confederate General Joseph E. Johnston was given the daunting task of uniting North Carolina’s thousands of scattered troops in an effort to stop Sherman’s legendary march. Outnumbered three to one, General Johnston’s 20,000 Rebel soldiers were no match for the approaching Union forces. North Carolina sat between U.S. Grant’s troops in Virginia and the northbound Union forces lead by General William T. Sherman, who had devastated the South Carolina countryside after capturing Columbia. General Johnston was determined to keep Sherman from uniting his troops with those lead by Grant. Bentonville would be the site of the deciding battle. In a continuation of his “March to the Sea”, Sherman split his troops into two wings: one wing attacked from the south, and the other from the east. General Johnston attacked the east wing. The south wing joined the battle on its second day, resulting in massive casualties during the tree-day battle. It was the largest battle ever fought on North Carolina soil, and the only significant attempt to stop Sherman after the fall of Atlanta the autumn before. Sherman advanced to Goldsboro, where he found much needed supplies for his exhausted troops. Later that spring, Johnston surrendered to Sherman in Durham, ending North Carolina’s role in the Civil War. Well over 4,000 men were either reported killed, wounded, or missing in the battle. The quaint farm home of Amy and John Harper, adjacent to the battlefield, was commandeered by Union forces, as the family elected to stay on the second floor. Their two-story home was transformed into a field hospital, where soldiers in both gray and blue bled the same shade of red on the straw-covered floor. Today, the historic building still stands majestically near the battleground, and is equipped with the crude instruments doctors used over 100 years ago in the makeshift clinic. The site’s Visitors Center contains Civil War exhibits and artifacts with an electric map plotting the troop battles and movements. The grounds adjacent to the site include a Confederate cemetery and monument to the 360 Confederate soldiers who died at the site. The original trenches constructed by the Union Army are still visible at the battle site. Nearly 30 historic markers document important sites throughout the 6,000-acre battlefield and 10 driving trail pull-offs are part of the Carolina’s Campaign Civil War Trail in Johnston County. 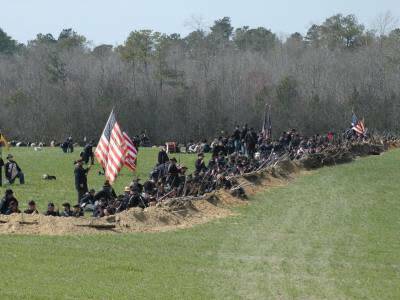 Living history encampments are held every year on the third weekend in March with major battle re-enactments held every five years, where over 50,000 will visit Johnston County. Hundreds of volunteers from across the Southeast re-create the spectacular yet turbulent battle for spectators. Seeing the proud re-enactors in their Union and Confederate costumes roaming the Carolina countryside is almost like being there over 145 years ago when American fought American for the soul of our great nation.